There are days that I pull myself out of bed and I have absolutely no idea where the day is going to lead me. I may make a tentative game plan but that usually gets side-swiped by life. I prefer it that way though. I have pretty much lived my life by schedules and itineraries. Having this blog and answering a different question everyday allows me to kind of just take life moment by moment. I still have responsibilities and I will make plans (I mean I work 60+ hours a week and I am taking Graduate school classes-sometimes you have to make plans in order for anything to happen) but as of lately I have kind of just let life happen. I used to always feel guilty if I would be completely lazy on my day off. I would always have a battle in my head thinking about all of the things I “should” be doing. I don’t have many lazy days so now when I have the opportunity I do enjoy them. Those are some of the times I am inspired most. I will crawl up in my recliner that is tucked in the corner of my room and watch movies or documentaries or escape into a book. It is like I am in my own sanctuary, the place that is completely mine. This place that I call all mine allows me to be myself without worrying about judgment and I am able to escape into my creativity. I had abandoned my creativity for such a long time and now that I have returned to it I am absolutely in love. I am the type of person that can find inspiration in almost anything. I soak in so much and allow myself to feel and be in the moment and not just think about it. For so long I would get caught up in my thoughts and I was not in touch with what I was feeling. Once I started to tune into what I was feeling, inspiration was everywhere. Yesterday I met a friend at Barnes and Noble to discuss WordPress and layout. We talked about my blog and I told her how strange everything has turned out to be. In the past when I wrote I used to only write at times I felt depressed, sad or anxious. I revisited a lot of my own writings and they reflected self-loathing and self-doubt. I still have times when I have to vent about what I am feeling and sometimes I do not enjoy those feelings but I have found a new love for writing during times of zen and peacefulness. I write from a place of happiness as opposed to a place of doubt. I truly believe I have rewired myself because of my determination. I had fallen to this place of self-hatred and depression and I was just sick of it. I knew I was the only person that was going to get myself out of that way of life so I forced myself to read more about uplifting experiences and I forced myself to find what I loved. I forced myself to take the positive beliefs about myself and bring them to the surface and not allow them to get lost again. Everyday is not perfect but it really is amazing how everything changes when you continually expose yourself to a different/more positive lifestyle. I have always said and I believe it to be 100% true, “If you believe you are defeated then in fact you are defeated.” It took me a long time but I have finally realized the truth behind choice. Our thoughts and out reactions are a choice. We may feel overwhelmed and we may be exposed to situations that we know will hurt us, anger us or make us sad but we have complete control of our reactions. We are in control of how we treat people. We are in control of the choices we make. Life has been about acceptance of these things and this has lead to great inspiration for me. Even moments that at the time felt horrible, that I was unable to understand, have been inspirational. I am inspired by people and their lives. I am inspired by music. I am inspired by movies. I am inspired by nature. I am inspired by world events and crisis. When I am feeling down, I make it a point to expose myself to documentaries or news stories that involve people that have gone through tragedies in some form or another. I do not enjoy reading this things but it allows me to see the value in my own life and not take what I have for granted. Everyone has a different story and I love that. I ask people a ridiculous amount of questions (sometimes it can annoy the hell out of them) and that is because I love hearing about other people’s journeys. It is amazing sometimes to find the similarities you may share with someone you never thought you would and even if you don’t, there is always the opportunity to learn and potentially experience something you may never have before. People inspire me to conquer fears all of the time. Sometimes I think to myself, “Diane you are living in a dream world.” I like my dream world. Yesterday I went to Barnes and Noble with a friend. We worked on the layout of this blog then went to dinner. After dinner we went to see the movie The Vow with Channing Tatum and Rachel McAdams. The amount of inspiration I felt and how much I took in during this day was amazing. I was able to people watch which is one of my favorite things in the world. How awesome is it to be sitting somewhere and just watch people and make up stories about them in your own head. The chances of you having the story right are probably slim to none but it’s like you are a screenwriter. You get to choose the plot of your characters. You sit and wonder if those people in life are happy. You wonder if they are in relationships and what those relationships are like. Are they in love or are they just going through the motions? What do these people worry about? Are these people a threat? This is another place I find inspiration. There are billions of people on this planet and everyone has a different story and have walked a different path. Other people have hardships that I am sure I wouldn’t even be able to imagine experiencing. People surprise me all of the time and I love that. Meeting people through this blog has been inspirational and so moving. I live in the Bible Belt of South Carolina (I am originally from northern NY-yes I still experience culture shock even after 10 years) and have received comments and questions from people in Australia and the UK. I feel like I have gained friends (even it is just in the virtual sense) from other cultures that are allowing me to learn about a life so different than my own. How awesome is that? Inspiration is constantly knocking on my door and I feel so lucky to hear it. I find inspiration in challenges. I find inspiration in hardships. I feel inspiration in displays of love and affection. I find inspiration in other people’s stories. I feel inspiration in my fears. I feel inspiration in arguments. I feel inspiration through tears and sadness. I feel inspiration through sitting in silence and just looking at what surrounds me. It is these inspirations that make me feel alive. It is these inspirations that push me so much farther than I ever thought I could go. It is these inspirations that constantly drive me to want to learn and experience more and more. It is these inspirations that make me want to help and teach others. It is these inspirations that make me love in a way that is so genuine and so deep. It is these inspirations that make me compassionate and empathetic. It is these inspirations that make me want to hug someone when they feel like their world is falling apart (even if I feel like my world is falling apart too). It is these inspirations that let me know that everything really is going to be ok.
Of course I could go on and on with stories and details of specific inspirations but I will save that for another blog entry. For now I must depart and let inspiration find me. 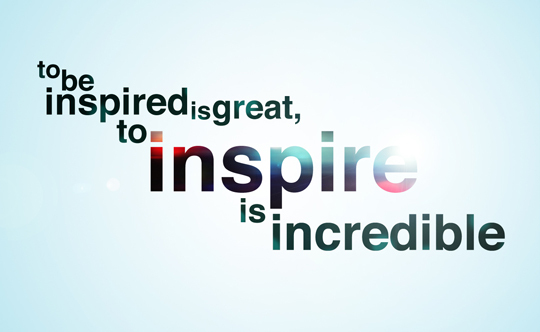 I am curious though, my fellow readers, what specifically inspires you and what do you do when you feel inspired? Inspiration comes through whatever captures my attention and sparks a reaction. From the steam of a breath on a cold morning to the beauty of a Key West Sunset. Inspiration comes through a whisper and comes through the loudest concert. Inspiration is that spark which ignites creativity. My inspiration comes from people. The innate bad that they represent. Kind of dismal, but it is what it is. If nothing else – it makes me get out of my house and into the world to experience life. And It makes me not worry about little things like being super clean or organised. This is a beautiful post on inspiration. I hate to feel like I’m doing nothing do because I always end up wondering about “what I “should” be doing”. I find inspiration from my personal life and feelings, the environment, social stuff… Inspiration is universal to me. It’s everywhere and nowhere. 🙂 It is our world.